Beyond B5 Flexcore Thruster - Set to fit FCS Boxes. Beyond® B5 Flexcore Thruster Set with a precision placed and engineered hex flex core – to fit Futures boxes. Engineered to exacting standards for tunable flex surfboards to provide a variable stiffness fin for drive and transition through a wide range of manoeuvres. A small/medium area fin for all waves up to 6′ where early release and easy transition are a priority. 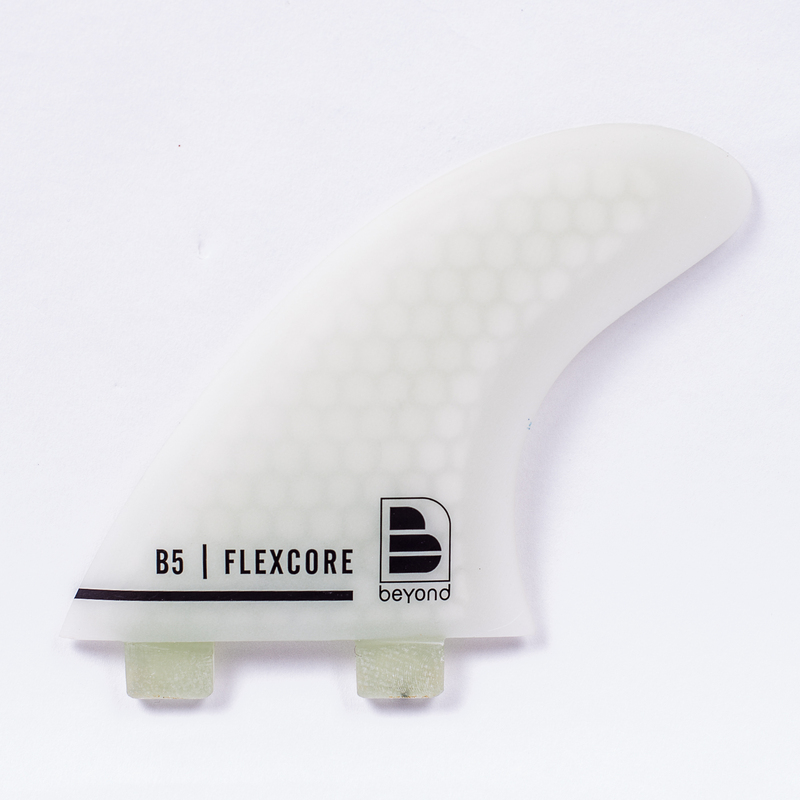 Some surfers prefer the stiffer feel of these fins enabling more accurate fast transitions and direction changes. Less flex than the Beyond Ultraglass cores, but retains the drive. Total visible quality in a range of colours. Try B3’s for less area giving reduced hold and drive, or the B7’s in big surf for ultimate hold and drive where large faces or hollow waves demand ultimate traction! 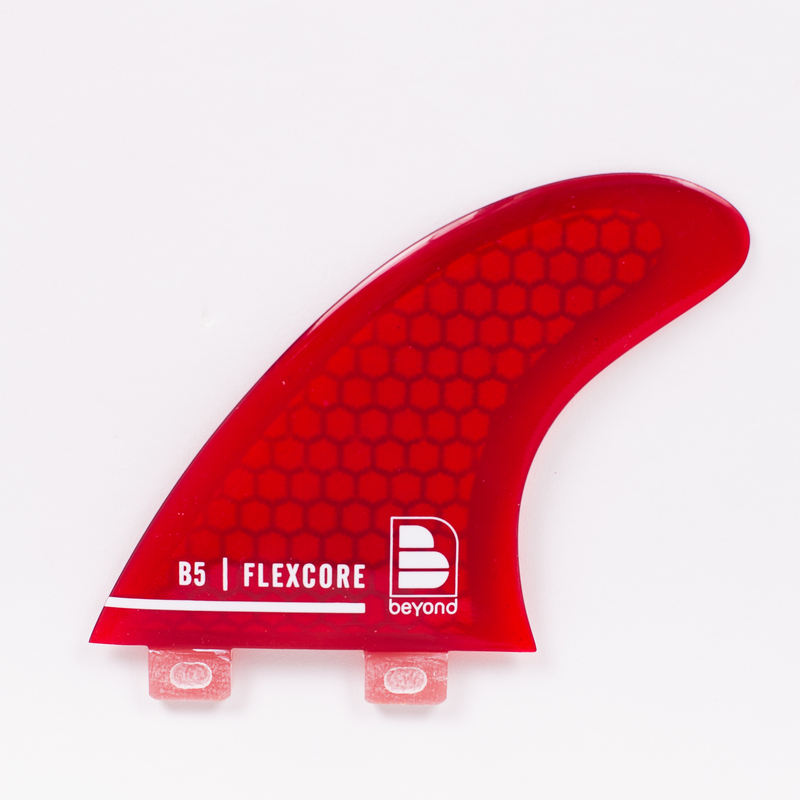 Beyond Flex Core fins are designed to provide flex patterns from tip to base for extreme surfing situations. 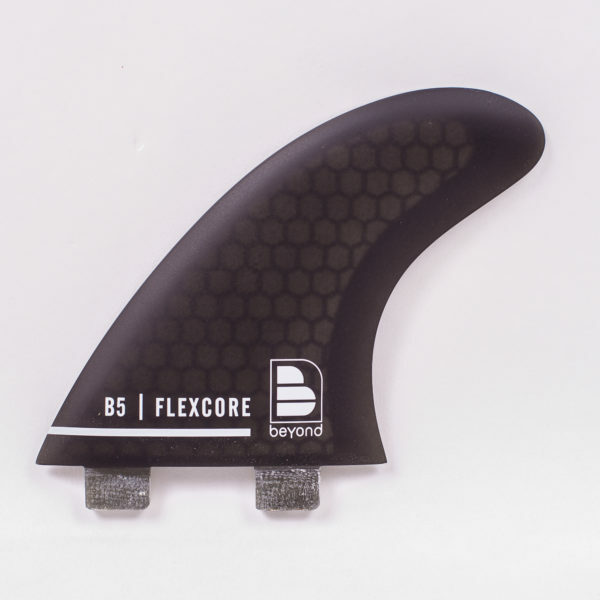 For a different flex and drive pattern try the Beyond Carboncore fin range, or the Ultraglass range of pure glass fins. Beyond® B5 Flexcore Thruster Set with a precision placed and engineered hex flex core – to fit Futures boxes. Engineered to exacting standards for tunable flex surfboards to provide a variable stiffness fin for drive and transition through a wide range of manoeuvres. A small/medium area fin for all waves up to 6′ where early release and easy transition are a priority. Some surfers prefer the stiffer feel of these fins enabling more accurate fast transitions and direction changes. Less flex than the Beyond Ultraglass cores, but retains the drive. Total visible quality. No paint or decals to hide defective construction. Our Single best selling set of fins – the best drive, feel and response, apparently. Try B3’s for less area giving reduced hold and drive, or the B7’s in big surf for ultimate hold and drive where large faces or hollow waves demand ultimate traction! Beyond Flex Core fins are designed to provide flex patterns from tip to base for extreme surfing situations. For a different flex and drive pattern try the Beyond Carboncore fin range, or the Ultraglass range of pure glass fins.